OUR OTHER CURRENTLY FEATURED BOOKS, “FAITHFULLY YOURS,” BY PEGGY FREZON AND “FLOYD THE DOG,” BY DONALD G. FORD, CAN BE FOUND BY SCROLLING DOWN BELOW THIS POST. THE PUBLISHER: Ashland Creek Press Ashland Creek Press is dedicated to publishing books with a world view. We’re passionate about the environment, animal protection, ecology, and wildlife, and our goal is to publish books that combine these themes with compelling stories. SUMMARY: Sometimes, life becomes unleashed. Sixteen-year-old Iris Moody has a problem controlling her temper — but then, she has a lot to be angry about. Dead mother. Workaholic father. Dumped by her boyfriend. Failing English. THE BACK STORY: I have been the dog columnist at The Los Feliz Ledger (a local, Los Angeles paper) for over ten years. While I was researching a column I came across a non-profit organization called k-9 Connection in Santa Monica that places at-risk youth alongside shelter dogs. I thought this would make a great premise for a novel. I also had some personal experience with a pit bull that suffered from redirected aggression, like the dog, Roman, deals with in my novel. WHY THIS TITLE? : As I got further in to writing the story about Iris and the shelter dog, Roman, I came to the realization that Iris, even though a human, is in many ways a “stray” like Roman. I wanted to explore the ways in which “connecting” can take us from strays status to being part of a community. WHY WOULD SOMEONE WANT TO READ IT? I think my story touches on the animal-human bond. Iris overcomes a lot throughout the course of the story. She is by no means perfect by the end, but she does grow. I think that her capacity for change can be inspirational. “One doesn’t expect humor to evolve from such a serious theme; but, it does. One doesn’t expect Strays to use the intersection of two fearful personalities to explore positive change and courage – yet, it does. And any who anticipate Strays to be a dog story alone may be disappointed only because it’s so much more; it focuses equally on pet and person, and the situations that get them into trouble. “Young adults who want a story of more than an animal rescue or a sixteen-year-old’s angst will find Strays a compelling saga.” — — D. Donovan, Senior Book Reviewer, Midwest Book Review. “…an engaging book about a journey of self-discovery that should inspire readers of all ages” – The Bark magazine. 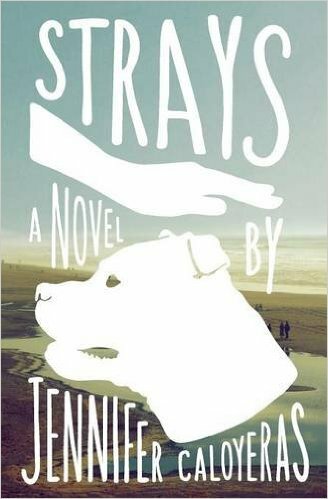 “Strays is a quietly moving story about starting over, and the powerful bond that can form betwen animals and humans. Caloyeras’ prose is instantly captivating, and readers will feel for Iris’s agony and her pain. Iris is a multi-faceted character — as are the others we are introduced to throughout the story. T ese fully realized individuals, both people and dogs, are what really bring Strays to life.” — Novel Novice. AUTHOR PROFILE: Jennifer Caloyeras is a novelist and short fiction writer living in Los Angeles. She holds a B.A. In English from the University of California at Santa Cruz, a M.A. in English Literature from California State University Los Angeles and a M.F.A. in creative writing through the University of British Columbia. She is the author of two young adult novels: Strays (2015) and Urban Falcon (2009). Her short stories have been published in Monday Night Literary, Wilde Magazine, Storm Cellar and Booth. She has been a college instructor, elementary school teacher and camp counselor. She is the dog columnist for the Los Feliz Ledger and the Larchmont Ledger. She is the proud owner of two rescue dogs: Reba, a 12-year old Jack-Russell mutt and Dingo, a feisty 1 1/2 year old corgi / Australian Shepherd mix. LOCAL OUTLETS: order at your local bookstore!